Turkish authorities have told U.S. officials that they have recordings from inside the Saudi consulate in Istanbul that provide evidence that missing journalist Jamal Khashoggi was killed inside, officials told NBC News. Additional details reported by The Washington Post suggest the tapes included gruesome details about his death, including Khashoggi being interrogated, beaten, tortured and murdered. The Post cited both U.S. and Turkish officials who spoke about the recordings. It’s not clear whether the tapes have been given to U.S. officials to review. NBC News has not heard or seen the recordings. Nor is it clear whether the United States may have its own tapes or other intelligence providing insight into what happened inside the consulate. But former U.S. intelligence officials told NBC News that’s a possibility considering that Saudi Arabia’s government is considered a high-value target for the U.S. intelligence community. Mounting evidence that Saudi Arabia was involved in Khashoggi’s disappearance has fueled a growing outcry from foreign governments, U.S. lawmakers and the Trump administration, all of whom have demanded more information from the Saudis. President Donald trump said Friday that he planned to call Saudi Arabia’s King Salman "pretty soon" about the issue. His top diplomat, Secretary of State Mike Pompeo, spoke with Khashoggi’s fiancée, Hatice Cengiz, a State Department official said. 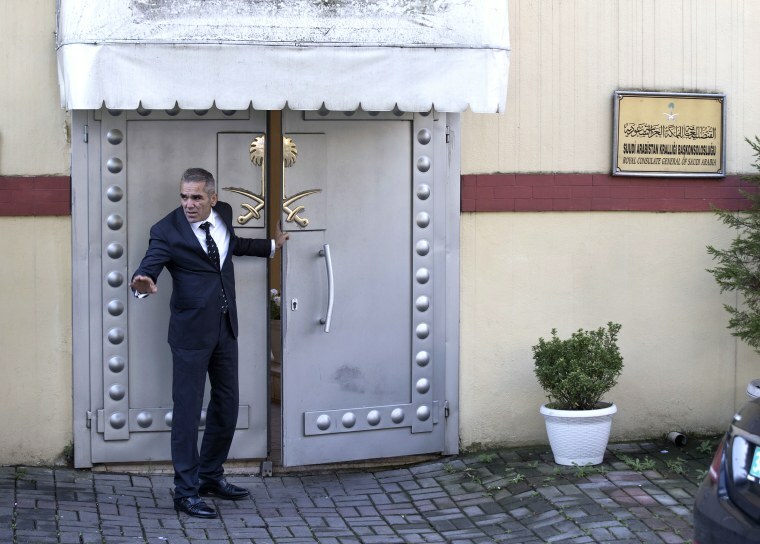 Cengiz had been waiting for Khashoggi outside the consulate, where he had gone to obtain a divorce document needed for their upcoming wedding. Khashoggi, a Saudi citizen and critic of the government, vanished last Tuesday after entering the consulate. His disappearance has become a major diplomatic crisis for Saudi Arabia. Businesses and news organizations that planned to attend an upcoming conference in the country pulled out, and one of the country’s lobbying firms in the U.S., the Harbor Group, ended its contract with the kingdom this week due to the incident, the firm told NBC News. The Turks, even as they release additional information implicating Saudi Arabia, have agreed to conduct a joint investigation with the Saudis. Saudi Arabia’s foreign ministry said Friday that it welcomes that agreement, adding that the kingdom considers the safety of its citizens to be top priority “irrespective of their location."